U.S. Documented. Super clean and well equipped 1985 58' Symbol Motor yacht. Very rare. This vessel has twin 3208 Caterpillars with only 2,300 hours, Northern Lights genset with one hour, Onan 12 kW with 533 hours and a full electronics package. There are 3 staterooms, 2 of which have walk-around queen sized berths featuring custom made mattresses, 2-1/2 heads (one with tub), 2 helm stations, stand up engine room, 2 cranes (one forward, one aft), bimini canvas and much much more. Located in sunny beautiful La Paz, BCS, Mexico on the hard for easy viewing. 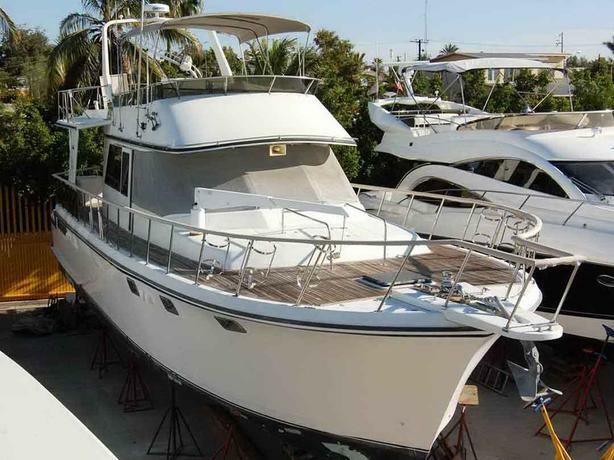 Will need some TLC to go cruising but priced well below market.